Staff members at the nation's largest teachers' union are guaranteed pay for the time they spend in jail if it is related to union work. Staffers at the National Education Association, the union that represents about 3 million American educators and school employees, are entitled to their standard wage rate during their incarceration, according to a copy of their contract first reported by The 74 Million. "Some union staffers can receive incarceration pay ‘for reasons stemming from actions taken by him/her in the scope of his/her Association employment.' The NEA contract specifies that this will be at the regular hourly rate for all time spent in jail," the website reports. 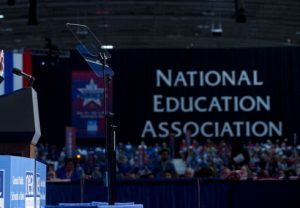 The National Education Association Staff Organization represents 369 staff members employed by the union and takes in $600,000 in dues and fees each year—a drop in the bucket compared with the NEA's $387 million revenue in 2016. Neither the NEA nor the staffers' union responded to request for comment about the provision or whether it has been invoked by union employees in the past. The staff members have a history of including compensation during imprisonment in their union contracts. The group's previous contract, which took effect in 2012 and expired in 2015, also included a section that protected worker pay in the event that they were arrested during the course of union activities. The contract mandates that the union cover not only the employee's wages, but the legal defense costs associated with criminal or civil trials. Only in cases of "gross negligence or gross irresponsibility" is the union relieved of its duty to cover such expenses. "NEA shall defend and save an employee harmless from any personal financial liability (including fines, reasonable attorneys' fees, posting of bail or bond, etc.) arising out of any claim, suit, criminal prosecution or judgment against him/her because he/she is an employee of NEA or because of any act taken by him/her in the course of his/her employment," the contract says. "If an employee is incarcerated for the foregoing reasons, he/she shall be paid at his/her regular hourly rate for all time spent in jail." Not every union has such protections for members. A senior Teamsters official and key ally of union president James Hoffa Jr. turned to crowdfunding in April to support his legal defense in a civil union corruption investigation. Rome Aloise, who earned a combined $380,000 in compensation for his local, state, and national roles at the Teamsters, started a website to collect as much as $14,000 from donors willing to defend him against charges that he rigged union elections and accepted gifts from companies that he was supposed to be negotiating with on behalf of workers. Patrick Semmens, a spokesman for the labor watchdog National Right to Work Committee, said that the NEA's contract is the first he has seen with an imprisonment clause. He said it was "outrageous" that teachers are forced to pay union officials' legal troubles, especially in school districts that mandate union membership. "This is another example of the outrageous activities teachers are forced to subsidize because of union boss forced dues powers," he said.